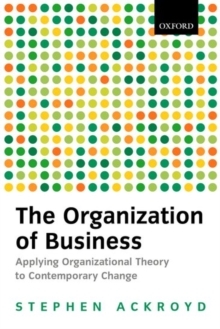 This text applies organization theory to British business and illuminates its historical and contemporary organizational patterns. The text is unique in that it systematically combines organization theory with the results of historical and social-scientific research, to produce an authoritative account of contemporary organizational change. The argument is amply illustrated by the presentation and discussion of highly topical case studies of big business strategy. Professor Ackroyd argues that the orthodox (contingency) approach to organizational structure does not provide an adequate analysis of current structural changes in the British economy. He puts forward an alternative perspective on organizational structures which draws on both classical ideas (particularly those of Weber) and some recent theory, to produce an account of the typical historical patterns of both large and small UK organizations and to illuminate their contemporary transformations. Using established social-scientific research, Professor Ackroyd shows that British organizations are adopting some highly distinctive new organizational forms and patterns of inter-firm relationships. This analysis is then used as the basis for a presentation and critique of much of the abundant writing on contemporary organizational change, including sophisticated theories such as institutional theory, regulationist theory and ideas on the effects of globalization. Finally, Professor Ackroyd shows that much organizational change today has clear policy implications for government.